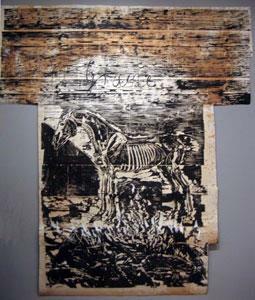 Anselm Kiefer Grane, Woodcut with paint and collage on paper mounted on linen, Museum of Modern Art, New York. Anselm Kiefer (born March 8, 1945) is a German painter and sculptor. He studied with Joseph Beuys and Peter Dreher during the 1970s. His works incorporate materials such as straw, ash, clay, lead, and shellac. The poems of Paul Celan have played a role in developing Kiefer's themes of German history and the horror of the Holocaust, as have the spiritual concepts of Kabbalah. His works are characterised by an unflinching willingness to confront his culture's dark past, and unrealized potential, in works that are often done on a large, confrontational scale well suited to the subjects. It is also characteristic of his work to find signatures and/or names of people of historical importance, legendary figures or places particularly pregnant with history. All of these are encoded sigils through which Kiefer seeks to process the past; this has resulted in his work being linked with a style called New Symbolism. Kiefer has lived and worked in France since 1991. Since 2008, he has lived and worked primarily in Paris and in Alcácer do Sal, Portugal. The son of an art teacher, Kiefer was born in Donaueschingen, Germany, on March 8, 1945, just a few months before the end of World War II. In 1951 he moved to Ottersdorf and attended grammar school in Rastatt. In 1966, he abandoned his law and Romance language studies at University of Freiburg to study at art academies in Freiburg, Karlsruhe, and Düsseldorf. In Karlsruhe, he studied under Peter Dreher, an important realist and figurative painter. Kiefer began his career as a photographer with performances in which he, in paramilitary costumes, mimicked the Nazi salute on various locations in France, Switzerland and Italy calling for Germans to remember and to acknowledge the loss to their culture through the mad xenophobia of the Third Reich. In 1969, at Galerie am Kaiserplatz, Karlsruhe, he presented his first single exhibition "Besetzungen (Occupations)" with a series of photographs about controversial political actions. Kiefer is best known for his paintings, which have grown increasingly large in scale with additions of lead, broken glass, and dried flowers or plants, resulting in encrusted surfaces and thick layers of impasto. By 1970, while studying informally under straw, wood and plant parts. The use of these materials meant that his art works became temporary and fragile, as Kiefer himself is well aware; he also wanted to showcase the materials in such a way that they were not disguised and could be represented in their natural form. The fragility of his work contrasts with the stark subject matter in his paintings. This use of familiar materials to express ideas was influenced by Beuys's art practice, in which he used fat and carpet felt. It is also typical of the Neo-Expressionist style. After many years away, Kiefer returned in 1971 to live and work in Donaueschingen. In the years that followed, he incorporated German mythology in particular in his work, and in the next decade he argued with the Kabbalah. He went on extended journeys throughout Europe, the USA and the Middle East; the latter two journeys further influenced his work. Besides paintings, Kiefer created sculptures, watercolors, woodcuts, and photographs. Throughout the 1970s and early 1980s, Kiefer made numerous paintings, watercolors, woodcuts, and books on themes interpreted by Richard Wagner in his four-opera cycle Der Ring des Nibelungen (The Ring of the Nibelung). In the early 1980s, he created more than thirty paintings, painted photographs, and watercolors that refer in their titles and inscriptions to the Romanian Jewish writer Paul Celan's poem "Todesfuge" ("Death Fugue"). A series of paintings Kiefer executed between 1980 and 1983 depict looming stone edifices, referring to famous examples of National Socialist architecture, particularly buildings designed by Albert Speer and Wilhelm Kreis. The grand plaza in To the Unknown Painter (1983) specifically refers to the outdoor courtyard of Hitler's Chancellery in Berlin, designed by Speer in 1938 in honor of the Unknown Soldier. In 1984–85, he made a series of works on paper incorporating manipulated black-and-white photographs of desolate landscapes with utility poles and power lines. Such works, like Heavy Cloud (1985), were an indirect response to the controversy in West Germany in the early 1980s about NATO's stationing of tactical nuclear missiles on German soil and the placement of nuclear fuel processing facilities. By the mid-1980s, Kiefer’s themes widened from a focus on Germany's role in civilization to the fate of art and culture in general. His work became more sculptural and involved not only national identity and collective memory, but also occult symbolism, theology and mysticism. The theme of all the work is the trauma experienced by entire societies, and the continual rebirth and renewal in life. During the 1980s his paintings became more physical, and featured unusual textures and materials. The range of his themes broadened to include references to ancient Hebrew and Egyptian history, as in the large painting Osiris and Isis (1985–87). His paintings of the 1990s, in particular, explore the universal myths of existence and meaning rather than those of national identity. From 1995 to 2001, he started a cycle of large paintings of the cosmos. He also started to turn to sculpture, although lead still remains his preferred medium. Since 2002, Kiefer has worked with concrete, creating the towers destined for the Pirelli warehouses in Milan, the series of tributes to Velimir Khlebnikov (paintings of the sea, with boats and an array of leaden objects, 2004-5), a return to the work of Paul Celan with a series of paintings featuring rune motifs (2004–6), and other sculptures. In 2006, Kiefer’s exhibition, Velimir Chlebnikov, was first shown in a small studio near Barjac in the South of France then moved to White Cube in London and finished in the Aldrich Contemporary Art Museum in rural Connecticut. The work consists of 30 large paintings—six feet high and around ten feet long—hanging in two banks of 15 on facing walls of an expressly constructed corrugated steel building that mimics the studio in which it was originally created. The work refers to the eccentric theories of the Russian futurist philosopher/poet Velimir Chlebnikov, who invented his own "language of the future" which he called "Zaum", and postulated, among other things, that cataclysmic sea battles shift the course of history once every 317 years. In his paintings, Kiefer’s toy-like battleships—misshapen, battered, rusted and hanging by twisted wires—are cast about by paint and plaster waves. The work’s recurrent color notes are black and white and gray and rust, and their surfaces are rough and slathered with paint and plaster and mud and clay. In 2009, Kiefer mounted two exhibitions at the Mesopotamia to the ruins of Germany in the aftermath of the Second World War, where he played as a small boy. "Anyone in search of a resonant meditation on the instability of built grandeur", wrote the historian Simon Schama in his catalogue essay, "would do well to look hard at Kiefer’s The Fertile Crescent". In Morgenthau Plan (2012), the gallery is filled with a sculpture of a golden wheat field, enclosed in a five-meter-high steel cage. From 1969, Kiefer also worked on book design. Early examples are typically worked-over photographs; his more recent books consist of sheets of lead layered with the artist's characteristic materials of paint, minerals, or dried plant matter. For example he assembled numerous lead books on steel shelves in libraries, as symbols of the stored, discarded knowledge of history. The book Rhine (1981) comprises a sequence of 25 woodcuts, that suggest a journey downstream along the banks of the Rhine. The river is central to Germany's geographical and historical development, acquiring an almost mythic significance in works such as Wagner's Ring of the Nibelungs. Scenes of the unspoiled river are interrupted by dark, swirling pages that represent the sinking of the battleship Bismarck in 1941, during an Atlantic sortie codenamed Rhine Exercise. In 2009, Kiefer directed and designed the sets for Am Anfang (In the Beginning) by Jörg Widmann at the Opéra National de Paris. Kiefer first made art at home in Hornbach. In 1991, Kiefer departed his studio in a large converted brick factory in Buchen, and spent time traveling in Japan, Mexico and India. In 1992 he established himself in Barjac, France, where he transformed his 35-hectare studio compound La Ribaute into a Gesamtkunstwerk. A derelict silk factory, his studio is enormous and in many ways is a comment on industrialization. He has created there an extensive system of glass buildings, archives, installations, storerooms for materials and paintings, subterranean chambers and corridors. Around 2008, Kiefer left his studio complex at Barjac and moved to Paris. A fleet of 110 lorries transported his work to a warehouse on the Périphérique in Croissy-Beaubourg, outside Paris, that had once been the depository for the La Samaritaine department store. A journalist wrote of Kiefer's abandoned studio complex: "He left behind the great work of Barjac – the art and buildings. A caretaker looks after it. Uninhabited, it quietly waits for nature to take over, because, as we know, over our cities grass will grow." In December 2011, Kiefer acquired the Mülheim-Kärlich Nuclear Power Plant, a decommissioned reactor near Koblenz. In 1969, Kiefer had his first solo exhibition, at Galerie am Kaiserplatz in Venice Biennale in 1980. He was also featured in the 1997 Venice Biennale with a one-man show held at the Museo Correr, concentrating on paintings and books. Comprehensive solo exhibitions of Kiefer's work have been organized by the Kunsthalle Düsseldorf (1984); Art Institute of Chicago (1987); Sezon Museum of Art in Tokyo (1993); Neue Nationalgalerie in Berlin (1991); Metropolitan Museum of Art in New York (1998); Fondation Beyeler in Basel (2001); the Modern Art Museum of Fort Worth (2005); the Hirshhorn Museum and Sculpture Garden (2006); the San Francisco Museum of Modern Art and the Guggenheim Museum Bilbao (2007). In 2007, the Guggenheim Museum Bilbao presented an extensive survey of recent work. In 2009, for the first time in Balearic Islands exhibed in the museum Es Baluard in Palma de Mallorca. In 2012, the Art Gallery of Hamilton presented a show on some of the artist's paintings. London's Royal Academy of Arts will mount the first British retrospective of the artist's work in an exhibition opening at the end of September 2014. In 2007, Kiefer was commissioned to create a huge site-specific installation of sculptures and paintings for the inaugural "
^ Anselm Kiefer White Cube. ^ Artista alemão Anselm Kiefer fixa-se em Portugal Público, August 27, 2009. ^ Mark Hudson (September 27, 2014), Anselm Kiefer on life, legacy and Barjac: 'I have no style, I'm not a brand' The Guardian. ^ Anselm Kiefer Guggenheim Collection. ^ Anselm Kiefer Gagosian Gallery. ^ (1974–75)My Father Pledged Me a SwordAnselm Kiefer, Metropolitan Museum of Art, New York. ^ (1980)Your Golden Hair, MargareteAnselm Kiefer, Metropolitan Museum of Art, New York. ^ , 1983)Dem Unbekannten Maler (To the Unknown Painter)Anselm Kiefer, Christie's Post-War and Contemporary Art Evening Sale, May 11, 2011, New York. ^ (1985)Heavy CloudAnselm Kiefer, Metropolitan Museum of Art, New York. ^ Sue Hubbard (October 24, 2008), Margarete (1981) by Anselm Kiefer (Saatchi collection) The Independent. ^ , 1996UntitledAnselm Kiefer: Christie's, February 8, 2001, London. ^ Anselm Kiefer Biographie Monumenta 2007, Paris. ^ "Anselm Kiefer: Karfunkelfee and The Fertile Crescent". White Cube. October 16, 2009. Retrieved October 25, 2010. 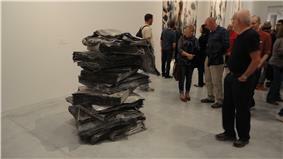 ^ Anselm Kiefer: Morgenthau Plan, October 19, 2012 - January 26, 2013 Gagosian Gallery, Paris. ^ Anselm Kiefer MoMA Collection, New York. ^ Roberta Smith (May 7, 1993), Anselm Kiefer, Emigre, In Two-Part Installation New York Times. ^ Alan Riding (April 3, 2001), Unseen as He Stares Down History; Look at the Art, Says Anselm Kiefer as He Turns to Jewish Mysticism New York Times. ^ Kristin Hohenadel (August 5, 2011), Following an Artist Into His Labyrinth New York Times. ^ Bradshaw, Peter (May 16, 2010). "Over Your Cities Grass Will Grow". The Guardian. UK. Retrieved October 25, 2010. ^ Appleyard, Brian (May 9, 2010). "Over our cities grass will grow". The Sunday Times. UK. Retrieved October 29, 2010. ^ Alex Needham (December 9, 2011), Anselm Kiefer: 'Art is difficult, it's not entertainment' The Guardian. ^ Anselm Kiefer: Your Age and Mine and the Age of the World, January 24 – February 28, 1998 Gagosian Gallery, New York. ^ Alan Riding (May 31, 2007), An Artist Sets Up House(s) at the Grand Palais New York Times. ^ Amy Serafin (October 21, 2007), The Louvre Now Accepts the Living New York Times. ^ Christopher Knight (April 18, 2008), Kiefer's higher ground Los Angeles Times. ^ Buhmann, Stephanie (January 2011). "Anselm Kiefer: Next Year in Jerusalem". The Brooklyn Rail. ^ Marion Maneker (July 26, 2011), Kiefer Fever Spreads Into The Art Market The Observer. ^ Spies, Werner. "2008 winner: Anselm Kiefer". Boersenverein. Archived from the original on October 8, 2010. Retrieved October 29, 2010. ^ "Reply to a parliamentary question" (pdf) (in German). p. 1708. Retrieved 27 November 2012. ^ John Russell (May 24, 1987), Painter Who Lends Fire To The Gods New York Times. Danto, Arthur. in "Anselm Kiefer". Encounter and Reflections: Art in the Historical Present. New York: Farrar Strauss Grioux, 1990. Auping, Michael. Anselm Kiefer: Heaven and Earth catalogue for exhibition of the same name, Modern Art Museum of Fort Worth, 2005. Munich: Preston, 2005. Andréa Lauterwein: Anselm Kiefer / Paul Celan. Myth, Mourning and Memory. With 157 illustrations, 140 in colour. London: Thames & Hudson, 2007, ISBN 978-0-500-23836-3. Fiennes, Sophie. Over Your Cities Grass Will Grow. Documentary film. 105 min. France, Netherlands, Great Britain, 2010. Kiefer left his first wife and children in Germany on his move to Barjac in 1992. Since 2008 he has lived in Paris, in a large house in the Marais district, with his second wife, the Austrian photographer Renate Graf, and their two children. Kiefer is represented by Yvon Lambert Gallery in Paris, Gagosian Gallery in New York, White Cube in London and Thaddaeus Ropac in Paris and Salzburg. Before moving to Gagosian, he showed with Marian Goodman Gallery, New York. In 2011, Christie's set a new worldwide record of $3.6 million for the artist, when it sold To the Unknown Painter (1983) to an American private collector. In 2008, Anselm Kiefer was awarded the Peace Prize of the German Book Trade, which was then given for the first time to a visual artist. Art historian Werner Spies said in his speech, that Kiefer is a passionate reader who takes impulses from literature for his work. In 2011 Kiefer was appointed to the chair of creativity in art at the Collège de France. "A complex critical engagement with history runs through Anselm Kiefer's work. His paintings as well as the sculptures of Richard Wagner or Goethe, thus continuing the historical tradition of painting as a medium of addressing the world. Only a few contemporary artists have such a pronounced sense of art's duty to engage the past and the ethical questions of the present, and are in the position to express the possibility of the absolution of guilt through human effort." Kiefer's works are included in numerous public collections, including the Hamburger Bahnhof, Berlin; the Museum of Modern Art and the Solomon R. Guggenheim Museum, New York; the Tate Modern, London; the San Francisco Museum of Art; the Art Gallery of Ontario, Toronto; the Albright-Knox Art Gallery, Buffalo; the Philadelphia Museum of Art; the National Gallery of Australia, Canberra; the Tel Aviv Museum of Art; and the Albertina, Vienna. The Metropolitan Museum of Art in New York owns a suite of 20 of the artist’s rare watercolors. Notable private collectors include, among others, Eli Broad and Andrew J. Hall. In Next Year in Jerusalem at Gagosian Gallery in 2010, Kiefer's first New York solo exhibition since 2002, each of the works, the artist explained, was a reaction to a personal "shock" initiated by something he had read, seen, or heard about. In 2008, Kiefer installed Palmsonntag (Palm Sunday) (2006), a monumental palm tree and thirty-six steel-and-glass reliquary tablets in the auditorium-gym of the First Baptist Church of Los Angeles, an enormous Spanish Gothic edifice built in 1927. The room was reconfigured to accommodate the work. Floors were sanded to remove the basketball court's markings, and the wall for the reliquary paintings was constructed inside the space. In 2010 the piece was installed at the Art Gallery of Ontario museum in Toronto, where Kiefer created 8 new panels specifically for the AGO's exhibition of this work.